Valued as tasty table fare, the California halibut is in great demand off the shores of the West Coast. When the waters begin to warm in the spring, halibut move up to the shallows where they stay until the fall. 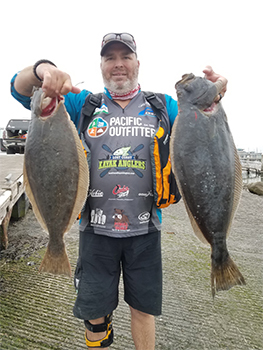 While this species is smaller than its larger cousin, the Pacific halibut, the sporty fish provides great action for kayak anglers. For a better look at the dos and don’ts of landing these tasty fish from a kayak, we reached out to YakGear brand ambassador Greg Mouton for his perspective. Originally from Mississippi, Mouton spent years in active military service before settling in at Eureka, which is situated along Humboldt Bay in northern California. The bay serves as home waters for Mouton, who regularly patrols the bay in his kayak, bouncing his baits along the sandy bottom. Mouton runs a light rig of a Seeker Tactic rod with a Seigler reel filled with 30-pound. braid. For his live bait presentation, Mouton uses a sliding sinker rig that suspends his bait just above the floor. This triggers an aggressive bite from halibut camouflaged in the sand. Halibut aren’t necessarily finicky about hitting the bait, so finding them is the key to filling his three-fish daily limit. Tides play a pivotal role in the feeding activity of halibut. When the water begins to move, you can bet Mouton is on the water. When drifting for halibut, Mouton uses a RAILBLAZA Rod Holder II and considers it one of his most critical pieces of equipment. Fishing for halibut from a kayak can bring advantages as opposed to fishing from a boat. Putting food on the table isn’t the only reason Mouton fishes from a kayak. 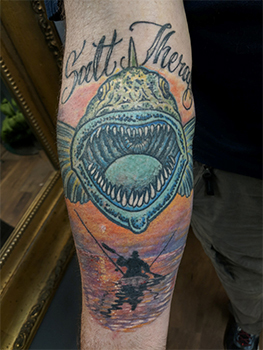 As a disabled combat veteran who suffers from PTSD, the angler considers his time on the water to be cathartic. Kayak fishing for halibut provides a great way for anglers to not only reap the benefits of the ocean, but to get out on the water and share a day with friends and family. When the waters of Humboldt Bay cool this autumn, the halibut will become harder to find. But, there is the solace in knowing next spring, these feisty fish will return, and you can bet that Mouton will be there when the halibut run begins.